Have we found King Henry V’s great ship the Holigost? A historic shipwreck discovered in a ‘medieval breaker’s yard’ in Hampshire is likely to be the remains of 600-year old warship, the Holigost. But what do we know about it? Dr Ian Friel is a historian and expert advisor to Historic England.The Holigost was one of four famous vessels known as the ‘great ships’, the biggest built in medieval England. These impressive warships were a symbol of royal power, built specifically to open the way for an English invasion of France. They were the personal property of King Henry V and the closest thing he had to a state navy. Completed between 1415 and 1420 these ships were the Trinity Royal, the Jesus, the Grace Dieu and the Holigost; their names bear witness to Henry’s personal devotion to the Holy Trinity. 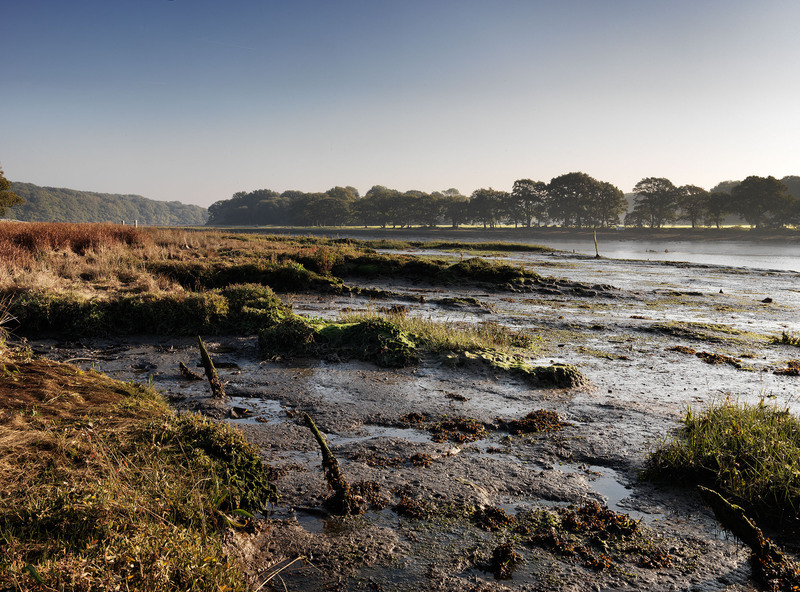 The wreck thought to be the Holigost has been found alongside the Grace Dieu, the largest of Henry V’s fleet, in the deep mud of the river Hamble in Hampshire. The Grace Dieu was a magnificent vessel, and the largest of Henry’s ships. Rediscovered in the 1930s it is the only one of Henry V’s to have been found, until now. What did the Holigost look like? Near-contemporary depictions in medieval manuscripts, now held by the British Library, give an idea of how the Holigost may have looked. The Holigost was a clinker-built (using overlapping planks of timber) carrack with one mast. It started life as a Spanish merchant ship, the Santa Clara, captured by the English and acquired by King Henry V. In 1414 Henry ordered for the ship to be rebuilt, ready to join his fleet. On 14 November 1415 the Holigost was delivered to Jordan Brownyng, the ship’s first and only master. What weapons did the Holigost carry? In the early 1400s, guns were still not carried in large numbers on ships, even on those intended for war. 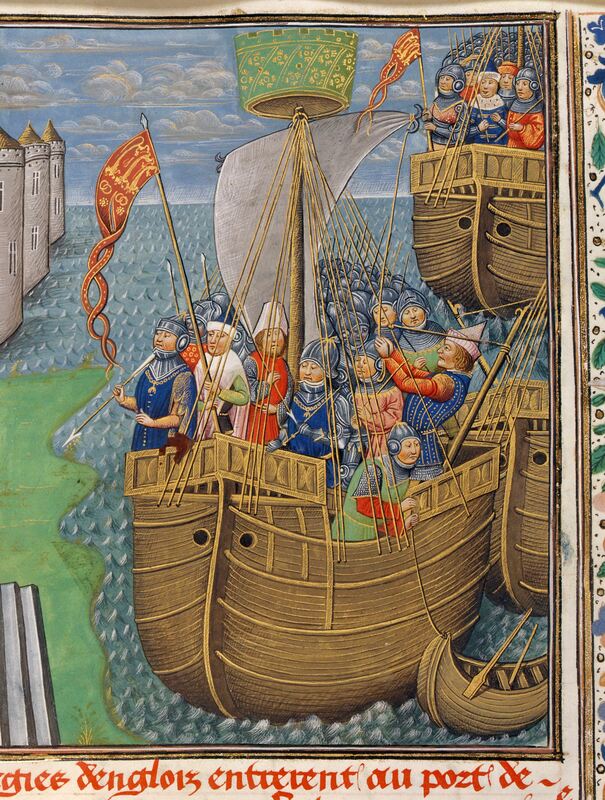 Henry V had more than 30 ships, yet only 15 of these had guns aboard. The Holigost was the most heavily gun-armed ship of Henry’s fleet, equipped with seven breech-loader guns. The Holigost started out with 13 anchors but was later equipped with a huge 4.8m long anchor. This anchor was so large that it even had its own name, Marie Tynktawe. In 1416 the Holigost had a crew of 200. The men were supplied with weaponry and armour, including 14 bows and over 2000 arrows, six crossbows, and a variety of helmets and hand weapons, such as poleaxes and spears. The two specifically naval weapons carried by the ship were gads and grapnels (hooks). Gads were iron spears thrown on to the sailors and soldiers on the deck of an enemy vessel. Falling over 100 ft these fearsome weapons could, and did, penetrate metal plate armour. 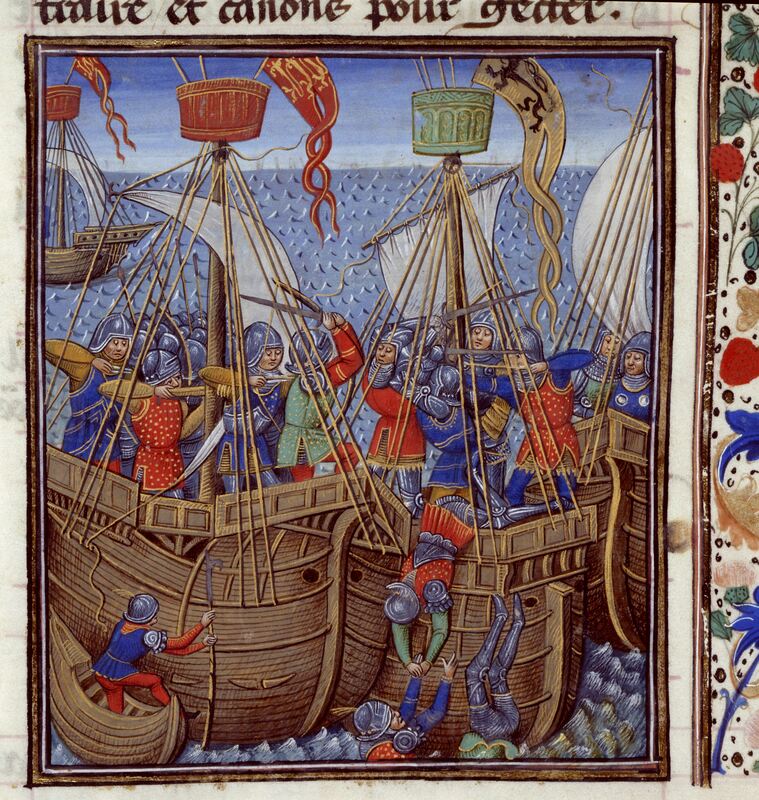 Medieval sea battles often ended with boarding actions fought between individual ships. Grapnels were used by the crew of the attacking ship to secure their vessel to an opponent’s warship. Did the Holigost see action? In a word, yes. On 15 August 1415 the Holigost was serving as the flagship of the English fleet with the Duke of Bedford in command. The ship suffered significant damage during the long and bloody siege of Harfleur. The enemy seemed to have boarded the ship and made serious efforts to bring down the mainmast. In the skirmish a grapnel was lost. The following year, on 25 July 1417 the Holigost went into battle once again, as part of an English force fighting a French-led fleet off the Chef de Caux at the mouth of the Seine. 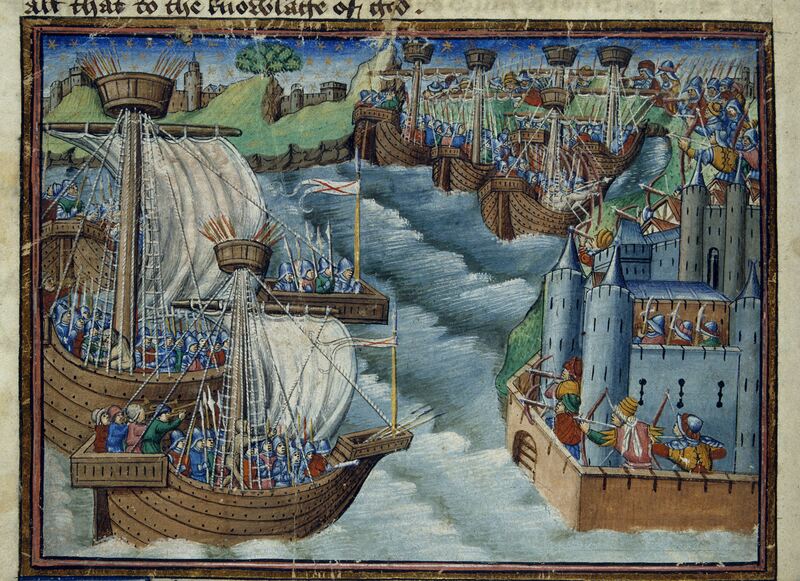 This battle broke the back of French seapower; less than a week later Henry V invaded France for the second time. What became of the Holigost? In Spring 1420 all four great ships were moored on the river Hamble for safe keeping. By 1423 we know the Holigost was leaking badly. A diver named Davy Owen was sent to swim underwater and block up cracks in the hull. This may well be the earliest-recorded instance of this kind of diving work in England. Between 1426 and 1430 the Holigost decayed fast. In these years the ship’s former master Jordan Brownyng lived aboard, and did his best to keep it afloat. It became a labour of love; a contemporary account records him working ‘night and day’ to combat leaks and pump out water. During the winter months of 1430 Brownyng stopped his work – this must mark the government’s effective abandonment of any hope of rebuilding the Holigost. Parts of the ship were salvaged in the following years, including 254 boards, timber and nails. The mast and rigging had been removed and taken to Southampton for storage in 1426. By 1452 the ship was described as ‘sunk in the sea and in this way broken’. Historic England is taking steps to protect and investigate this shipwreck. This exciting find has the potential to improve our understanding of medieval ships and naval warfare in the 15th century. Ian Friel’s new book, Henry V’s Navy, is published today by the History Press. It looks at the men, ships and operations of Henry’s sea war, and tells the dramatic and bloody story of the naval conflict, which at times came close to humiliating defeat for the English. 1 responses to Have we found King Henry V’s great ship the Holigost?